Corrosion is the most common cause of product failure. Understanding how corrosion occurs and how to prevent it from occurring is critical to designing products that function as required over their entire life. 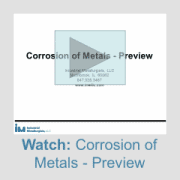 You should take this course if you make design decisions involving metal corrosion or need to be able to identify specific corrosion mechanisms when corrosion occurs. A good understanding of how to prevent corrosion is critical to making good design decisions and solving corrosion problems faster. The knowledge you’ll gain from this course will help you be more productive and profitable. The seven common metal corrosion mechanisms – uniform corrosion, galvanic corrosion, crevice corrosion, pitting corrosion, intergranular corrosion, stress corrosion cracking, dealloying. Click here to see the slides from module 1. Upon successful completion of the course you will receive a certificate for 6 credit hours (0.6 CEU’s). This course was designed for design, manufacturing, and quality engineers. Knowledge of the following concepts is required: grains, grain boundaries, crystal lattice, substitutional solid solution, diffusion, phases, precipitation strengthening, and microstructure. All these are taught in our Principles of Metallurgy course.